One day in Gokulam, Mysore (south India). I wake up. I´m thirsty but the glass of water is out of my reach, so I have to get up from my bed… As I try to lift up, I see that the body is not responding much. When I try to get up, the body collapses back to bed. So I try again, this time holding a wardrobe. I feel pain in the joints. Walking is difficult. I have to hold a wall to walk, or else I may fall down. This is how it all started. Soon upon my arrival to Mysore (in December 2017), after the little accident when I slipped on the wet bathroom floor and hit the spine right in its middle against a toilet (which was nothing to what was to come next), I caught a virus called viral arthritis. First it causes fever, attacks the joints making them inflammated, and stiff as a result. It restricts the body´s mobility and makes movement painful. As a bonus, it also brings red rash on the skin that keeps itching. I ended up consulting three more doctors, everyone prescribing different medicine and saying different things. The ayurvedic doctor predicts it may take up to two to three months for the body to fully recover to its original state. I panic. 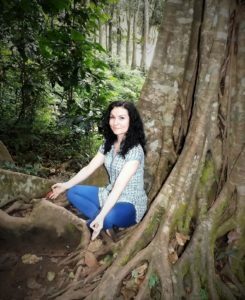 I´m in Mysore only for four months to attend intense yoga course, with the last two months to take teacher training with my dear teacher Vinay Kumar. As the year comes to its close, I take 14 pills a day and three doses of sirup for cough (yes, I got cold as well). However, the body can´t take anymore pills and the stomach ends up in pain. 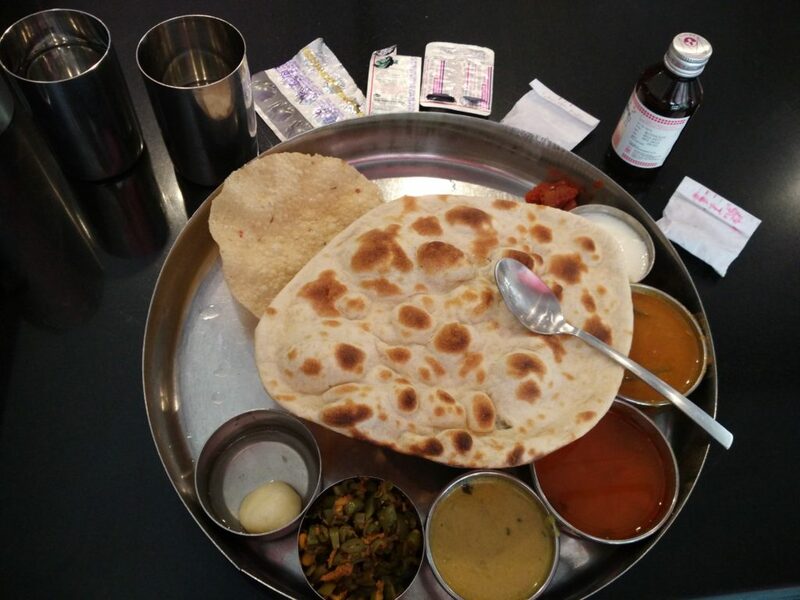 This was my lunch: south Indian thali and collection of pills (5 types of pills to be taken three times a day with each meal). Later the number luckily decreased to only 8 pills per day, which is what I´m taking now. In the meantime, I continue taking yoga classes twice a day six days a week, as I signed up for. Well, at least on the days when I´m able to walk there and climb all those stairs to the yoga shala. This becomes my measurement: If I can walk there by myself, I go. I struggle. It´s really hard. Stiffness, pain, and frustration go hand in hand. 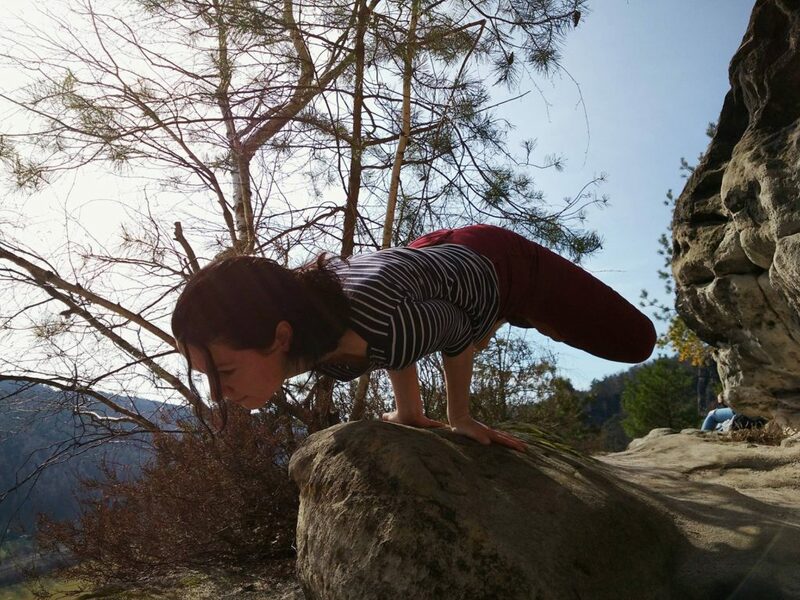 Not only am I not able to do some quite advanced asanas that I used to do before (splits, arm balances), but I can´t even do what I considered as the basics like padmasana (lotus) or udhva dhanurasana (the „big“ bridge). Sometimes I´d sit there and look around – and see all these flexible people doing things I used to do before, knowing it´s all gone. I never know what will bring next morning (every night the joints get swollen making it hard and painful to move). I don´t know when I will be healthy again. Nobody knows really. I think about all the things I did in order to be able to come to India for these precious months of learning from my teacher, I remember how much sacrifice it took to be able to come… and then I feel simply useless. I´m not able to do it anymore. I lost it. The sadness is overwhelming. The old yogic texts say that yoga practitioner should get healthy since disease is one of the obstacles on the way. Why? It can totally mess up your mind (apart from other things). Try to stay happy and cheerful when you feel omnipresent pain, when you are sick and tired. Control your mind fully. It´s not easy even for a healthy person. Also we hold on the perception of ourselves – on who we think we are (e.g. I´m Jana, I can do this and that), how we are seen by ourselves and others. But what if we take away all the attributes of what we think we are? What is left? 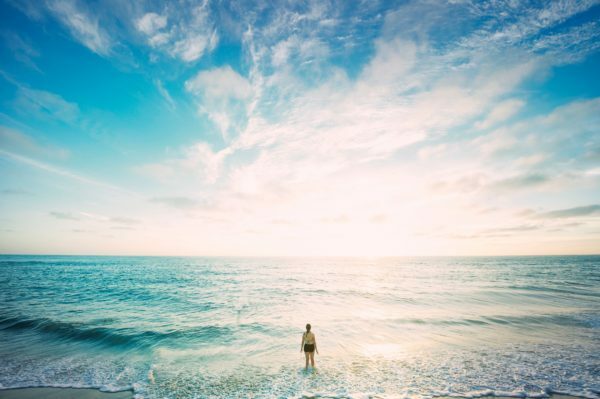 The path of yoga takes us right here – beyond the mind, beyond the perception of things around us, and even beyond the perception of ourselves. Bhagavadgita says that we should have no expectations in what we do. You just do it. Not for the result, but for the sake of doing it. That´s why I continue going to the classes. I just keep going and try my possible best of that day. Without thinking of what was in the past, or what will be in the future. Because nobody knows that anyway. Things will come and go. We always expect something. At the very least, we expect that the next morning when we wake up, we will be alive and able to move. But nobody can guarantee us that it will happen. We believe that if we do this and that, something will happen. We keep trying so hard. We plan things to happen. But what if they don´t? What if it never happens? Do we get sad/angry/frustrated/disappointed? Do we make excuses? We often say „I will do this tomorrow“ but what if there is no tomorrow? Nobody can take back the time. It´s the merciless law of nature. So we postpone things for tomorrow that never comes, eventually to give it up completely. We make false promises to ourselves, but hardly keep them up. We keep expecting things to happen in a way we want, but sometimes they don´t. What to do then? The Earth won´t stop moving because something did or did not happen. Nor should we. It´s the how we carry ourselves through life, not where to or why. It´s the way we can handle our fluctuating mind, whether we can stay calm whatever the life brings to us. It may be beautiful. Or it may not. Regardless of the fact, every experience is an opportunity to learn. To make the mind stronger, calmer, and as a result perhaps happier too? What next? Every day I try the best I can in what I do – yoga. Every morning I wake up in pain, but as the day progresses the pain decreases. Without yoga, it would be difficult. Even the ayurvedic doctor says that it takes months to be completely cured, even a year for some people. Often people have difficulties to walk and move in the first month. After a month, I did padmasana (lotus) and started balancing on my hands again… The time when we can feel the real power of yoga at its best is when we struggle; it makes us stronger (both mentally and physically), steadier, calmer. It gets the prana (life energy) moving, and that feels great. And even though it may be painful, through the pain we grow. Yoga is not about how many asanas we can “do” or how long we can hold our breath, but about how we handle life that shows us the true mirror of ourselves, without frills. Every morning is a new day, a new beginning. As the old saying “dum spiro, spero” says, as long as I breathe, I hope 🙂 What else is there left? 🙂 The hope and happiness we have inside us is to be cultivated, and we should let nothing and no one to take it away from us. Life is not always easy, yet it´s beautiful.